Dunava ("the Danube") is Seattle's premier Balkan women's choir, made up of singers with broad musical and performance experience and a passion for intricate harmonies and varying vocal technique. 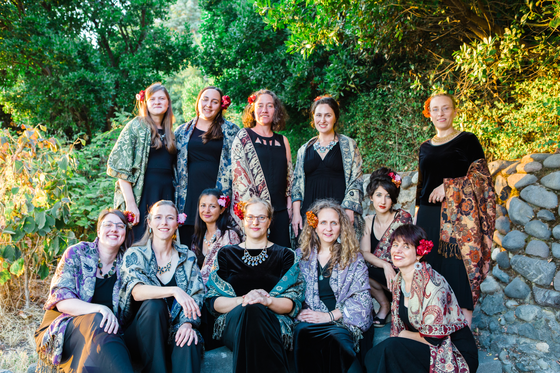 Dunava is dedicated to studying and performing traditional folk songs from Eastern Europe with respect and authenticity, and introducing audiences to these beautiful vocal traditions and songs. Dunava is affiliated with the Radost Folk Ensemble, and has performed at Northwest Folklife Festival, Croatia Fest, the Seattle Folklore Society concert series, the Seattle Art Museum, and at Seattle Town Hall. In 2014 Dunava was the first American group to participate in the international Silver Buckle folk festival in Kjustendil, Bulgaria. Dunava has released two CDs, Dunava (2009) and Bulgaria (2013), and is currently recording another album. "Pure vocal splendor! Power and nuance, both. Just amazing." "Dina and the ladies' impeccable harmonies, pitch, and timing are sheer joy!" "A wonderful group of voices, gorgeous harmonies, skillful blending, excellent choice of repertoire, good uses of solos and trios, just a terrific concert. Thank you so much for your investment in keeping this music alive and bringing it to all of us." "I am a big fan, lots of love from Serbia! Keep up the good work, ladies!" Check the schedule for events!